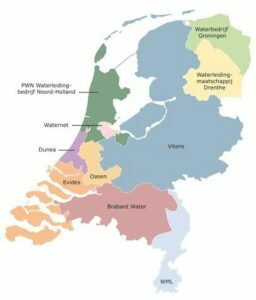 The Netherlands is divided into water regions and depending on the region where you live, you are obligated to register with the local water company. We can find out for you which company this is and arrange your connection. Why do I have to wait until after my move to sign up for water? To register with the local water supplier, we need your water meter readings. If you do not know the readings because you have not yet moved, we will send you a reminder or we will call you after your move so that we can get the reading from you. During the key transfer, the water meter reading will always be checked. Make sure you receive it or write it yourself. Why can not I choose my own water company? The Netherlands is divided into water regions and the drinking water of each region is regulated by a local water company. They take care of the water treatment, the water pipes and the installation of the connection in the house. There is only one company per address that facilitates this. In the Netherlands you are obliged to register with the local water company to ensure that your delivery continues. If you do not do this, it may be that your water connection is being closed. What does water cost in the Netherlands? A person uses an average of 50 m3 of water per year, the prices of water can vary with each company. For a single household you pay about € 10 to € 15 per month, for each additional person there is approximately a € 5 to € 10 charge.